If you think “Eight Movements,” the title of Liat Yossifor’s latest exhibition of paintings, sounds more like the title of a Philip Glass recording or the latest release by Steve Reich, you’re already onto the idea behind the Israeli artist’s stark and highly textural abstract works. For this second solo outing at New York’s Ameringer | McEnery | Yohe, Yossifor applies the same structural concepts of musical movements—divisions of longer works that each have distinct structural components such as key and tempo—to her artworks: each painting is produced within specific time constraints and rules. An individual piece consists of a single thick layer of oil paint that Yossifor manipulates with a palette knife; the work is produced over a three-day period, while the surface is still wet. But the process isn’t over when the paint turns slightly gray and sets. Like a composer of music, Yossifor has an editorial mind. 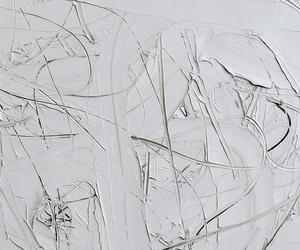 A key component of her technique is the scraping of settled paint, the final version of each painting comprising a series of revisions. The musical metaphor doesn’t end there. Yossifor’s palette—mostly white and pale gray with only an occasional splash of color—is reminiscent of sheet music, stark and practical, and the shapes and forms she creates with her brush and knife, like the notes of a musical score, are characterized by repetition. In addition, she intends some of the smaller works, called “Notes,” to complement the exhibition’s main pieces, offering the artist—and, by extension, the viewer—a brief rest before and after the exertion of creating (or, for the viewer, absorbing) the larger-scale works. In these paintings, as in music, timing is essential. And like Bach’s Six suites for unaccompanied cello, Yossifor’s “Eight Movements” are variations on a theme. Though the artist begins all eight in the same place—in the center of the composition, with the darkest color—some are large, others small, some are warmer, others cooler. They’re all slightly different from one another in tone and temperature. Together, they form a layered and satisfying body of work. Eight Movements” is on view at Ameringer | McEnery | Yohe, New York, Mar. 19–Apr. 18, 2015.